So what do power failures and terracotta planters have in common? I've been doing some poking around for emergency readiness (we're all doomed! ), and I've found a couple of really interesting and easy things that you can use terracotta planters for, if there's a power failure. Videos at the bottom of the post. First off; you can use them as an emergency refrigerator. They're called "Zeer pots", or evaporative coolers. 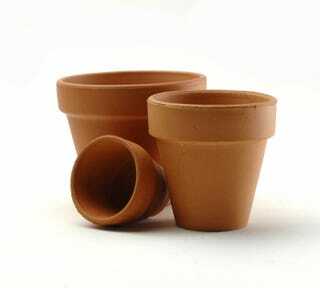 Two terracotta planters, one larger than the other, the smaller inside the larger, plug the holes at the bottom, put sand between the two pots, and then pour water to the saturation point. Cover with a damp towel, and you've got a refrigerator. Not a freezer though! These are being introduced into third world countries and are preventing a lot of food spoiling. Second; they can be used for emergency heating. Not so much an issue at this time of year, so I may repost part of this in the fall. There are a few different designs, some more elaborate than others, and there's some disagreement as to how effective they actually are. I haven't tried one yet; but I plan to in the fall. I suspect it works in a small area (careful about ventilation!). You need 2-3 pots in different sizes, a baking dish and tea lights. You put the tealights in the dish, upend the smallest pot so it sits on the lip of the dish, and close the hole in the bottom with something fireproof, and put the next largest pot on top. you will get heating through convection (the attached diagram has the intake arrows going the wrong way though) and radiant heat as the pots heat up. Be careful about knocking everything over.